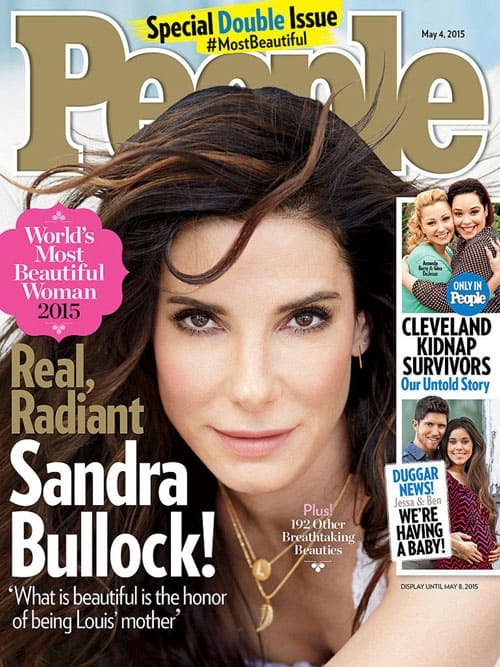 Sandra Bullock is People Magazine’s “Most Beautiful Woman” – But, is She Real? I have mixed feelings about Sandra Bullock being promoted as People’s “most beautiful woman” for 2015. On the one hand, it’s wonderful to see a 50-year-old woman being held up as a symbol of beauty. In addition, Bullock has always struck me as a genuine person, who cares about her family and the world around her. On the other hand, when I look at the cover of People, I can’t help but wonder – is this the real Sandra Bullock? In the image, Bullock doesn’t have a single wrinkle. Not one. Her hair is perfect. Her eyes are unnaturally white. So, either she is an alien. Or, People’s creative team has been working its magic on the picture. In the interview that accompanies the portrait, Sandra talks about her aging body with lighthearted humor. She comments that, when her son asked about her wrinkles, she replied, “Well, I hope some of them are from laughing so much.” That’s a great way of looking at it – so, why not show her true face in the picture? It says a lot about how we look at the aging process that someone as naturally radiant as Sandra Bullock still needs to be “enhanced” to be considered beautiful at 50. I’d love to hear your thoughts on this. Do you think that the media should present more natural images of beauty after 50? Why or why not? What do you think of People’s choice of Sandra Bullock as their 2015 “most beautiful woman?” Please join the conversation. Is it Possible to Be Cool in Your 70s?